But the rocket manufacturer claims it eliminated the problem. 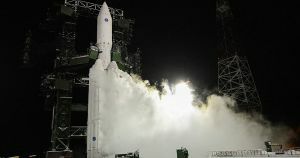 More bad news for the Russian space agency Rocosmos: Reuters reports that engineers found a fatal flaw in the design of its much anticipated Angara A5 heavy lift space rocket. The rocket went through its first test launch back in 2014. Once completed, it’s supposed to lug 20 metric tons of cargo into space at a time — roughly a third of the payload of SpaceX’s Heavy Falcon rocket. Now, Reuters reports that scientists warned of dangerous low-frequency oscillations that could rip the Angara A5 rocket’s RD-191 engines apart during launch. Despite efforts to reduce these oscillations, including the installation of a special valve, scientists working for Russian engine manufacturer Energomash allegedly warned that a launch could still end in disaster. Reuters mentions that a paper published by Energomash was reported on by the Russian RIA News earlier Friday. Oddly, RIA News later published an update stating that the problems had been eliminated and referencing an official press release on Energomash’s website. “Messages appearing in the media about a defect in the Angara RN engines contain inaccurate information that’s taken out of the context,” reads the press release, as interpreted by Google Translate. The news couldn’t have come at a worse time for Russia’s space ambitions. It comes after a bent Soyuz rocket sensor forced a NASA and Russian astronaut to make an emergency landing in October. A different, uncrewed cargo spacecraft fell back to Earth shortly after launch in December 2016. Russia’s current Proton M heavy launch rocket didn’t fare much better, experiencing a failure rate of ten percent. It’s impossible to say at this stage if Angara A5’s rocket is ready to launch. All we can do is hope that engine manufacturer Energomash has found a solution in time for next test.